Our diesel Toyota pickup truck rumbled down the dirt road towards our first stop: a “marae”, the generic name for ceremonial sites used by the ancient Polynesians. All that’s left of the site are vertical stone slabs resting on horizontal stone walls. “We don’t come here much,” explained the driver. “We go to Church on Sunday.” The ancient spirits stay at rest in the marae. Making our way towards the lagoon, we met a large, jovial lady and her companion sitting on upturned buckets on the water’s edge. 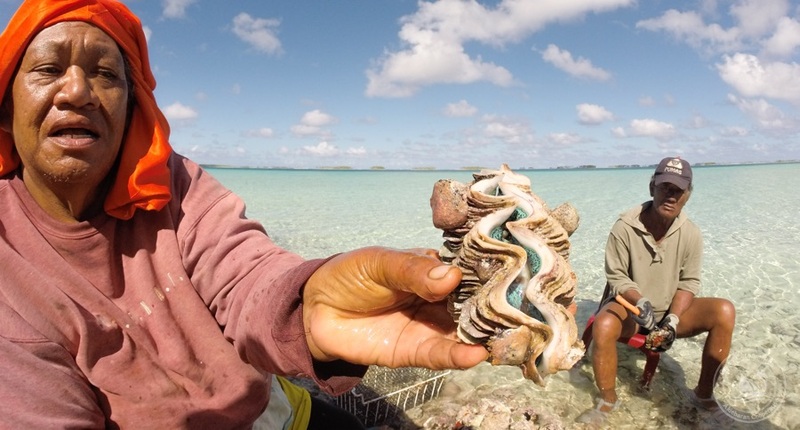 They were cleaning hundreds of clams, removing their inside meat, which they freeze and send to Papeete. Despite the lady’s swollen limbs from diabetes and filariasis (which causes elephantitis, or swelling of the limbs) she was positive and hard-working, and we enjoyed her company very much. Clams are the main economic product from the waters of the lagoon. Marguerite pointed to the scattered buoys anchored in the blue water. The buoys are essentially a clam farm, which are harvested every few months. Nevertheless, clams are minor as exports, compared to the massive copra agriculture, which covers nearly every plot of land on the atoll. A copra plantation was our next stop. WOW such amazing adventures and life experiences. Thanks for all the info and updates. So interesting and different from living in the USA all my life.